Mistakes happen, and sometimes the mistake is in a campaign we just sent. With Mailchimp Pro, you can use our Stop Delivery feature to cancel a Regular or Plain-Text Campaign after you click Send and before all of your recipients have received it. After you cancel a campaign, we'll track which subscribers already received the campaign, so you can create a segment to exclude or resend to later. This feature is included with Mailchimp Pro, which is available to add on to any pricing plan. Only Regular and Plain-Text Campaigns can be canceled. The campaign must have at least 10,000 recipients to be eligible for cancellation. The cancellation option is only available while your campaign is sending. Smaller lists process more quickly, while larger lists take longer. During the sending process, we'll show you the percentage of your subscribers who have received the campaign. 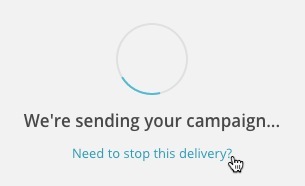 If you click to stop delivery, we'll start cancelling the campaign immediately. The process takes some time, though, so the final number of subscribers who receive the campaign may be higher than the percentage shown on the screen. When cancellation is complete, we'll send a confirmation email that lists the final number of recipients. If you cancel a campaign from a Pay As You Go account, we'll return the unused credits after the cancellation is complete. To cancel a campaign with our Stop Delivery feature, follow these steps. Click View Report next to the campaign you want to work with. Click Need to stop this delivery? On the Are you sure? pop-up modal, type CANCEL in the field provided, and click Confirm. We'll email a notification to the Primary Account Contact when cancellation is complete and the final recipient list is available. This process could take up to several hours. Once a campaign has been sent, it can't be stopped or edited. Learn why it's not possible to stop or edit sent campaigns. Learn how to delete campaigns from your Mailchimp account.